This pillowcase was sent to me for evaluation some weeks ago. 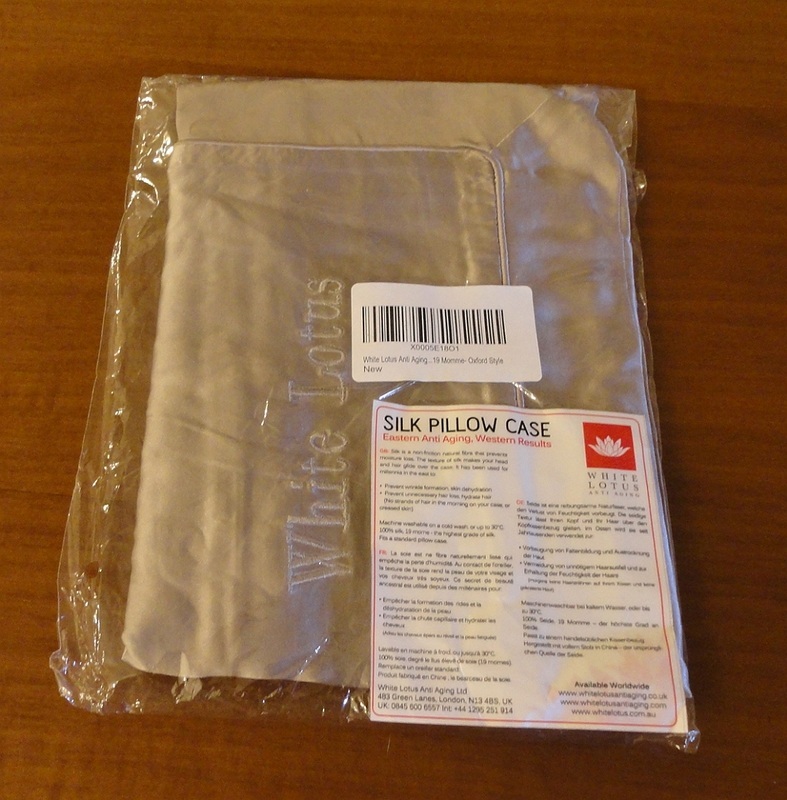 Since I already use a silk pillowcase (and am aware of the benefits, not to mention the comfort), I asked my husband to try it out. The review sample was only available in Pearl Grey. To my relief, it has turned out to be a very beautiful shade of shimmery pale mushroom, without any trace of pink or purple, and so quite acceptable to my test subject! It's a difficult item to photograph accurately because it tends to reflect the ambient light and nearby colours, but I really like how it looks. It is superbly made with piping, a generous flange and the brand name embroidered in a corner in matching thread. 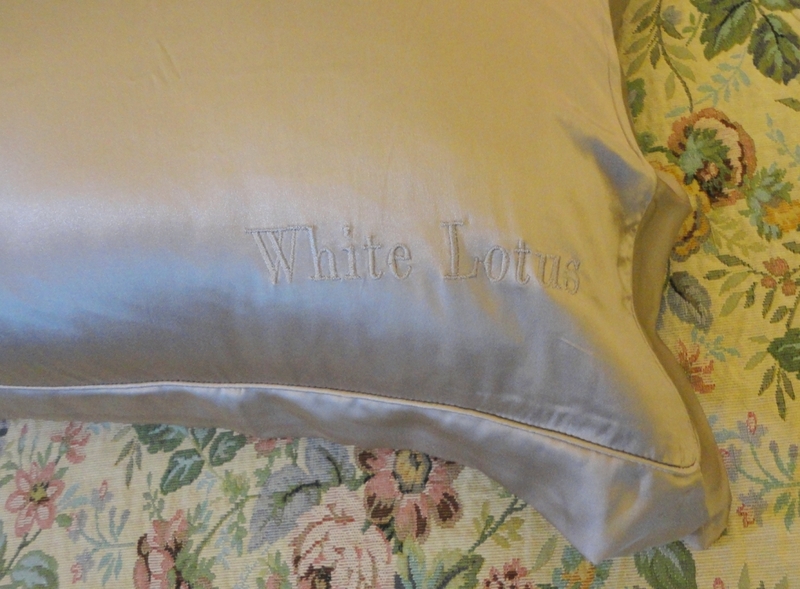 This pillowcase is entirely made of Mulberry silk, top and bottom. To understand the quality rating I had to read up on it. 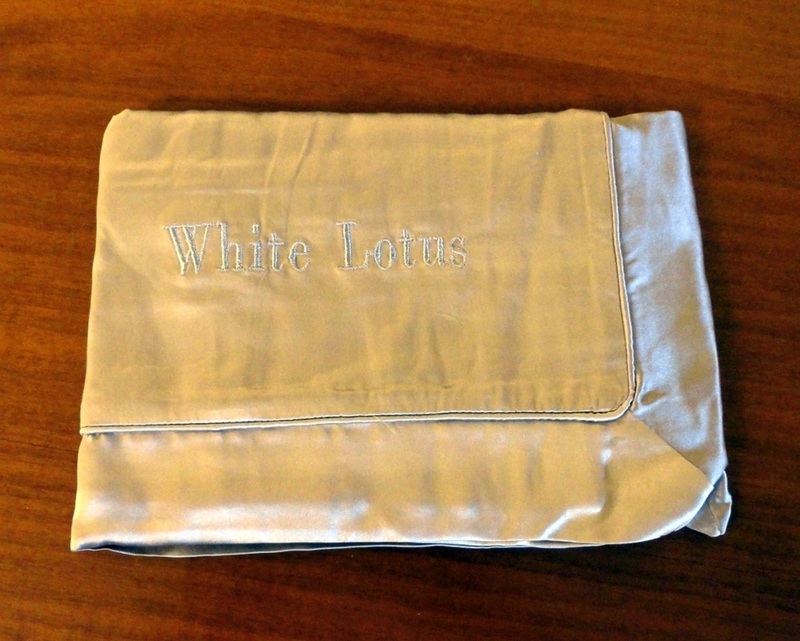 Unlike other fabrics, thread count is meaningless because silk thread is so fine that it would be very high in any case, so instead momme weight is used. 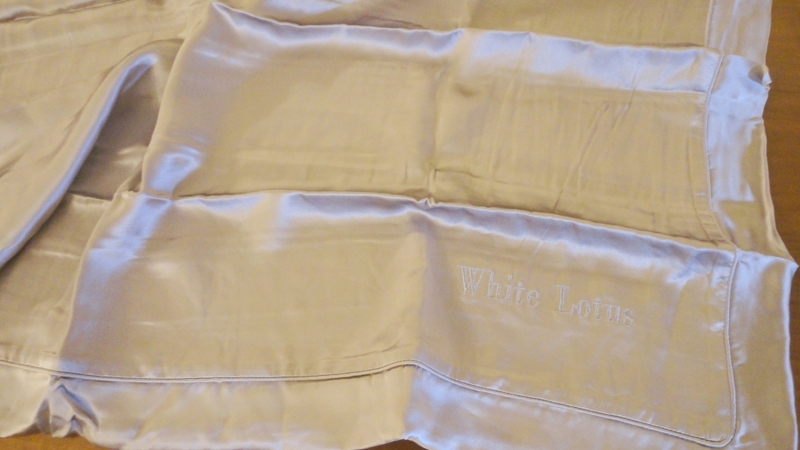 It is the weight in pounds of 100 yards of silk, 45 inches wide. The normal range is between 6 and 30 momme, but for bedding the most desirable weight is 19 momme, as this represents the best compromise between durability, appearance and cost. 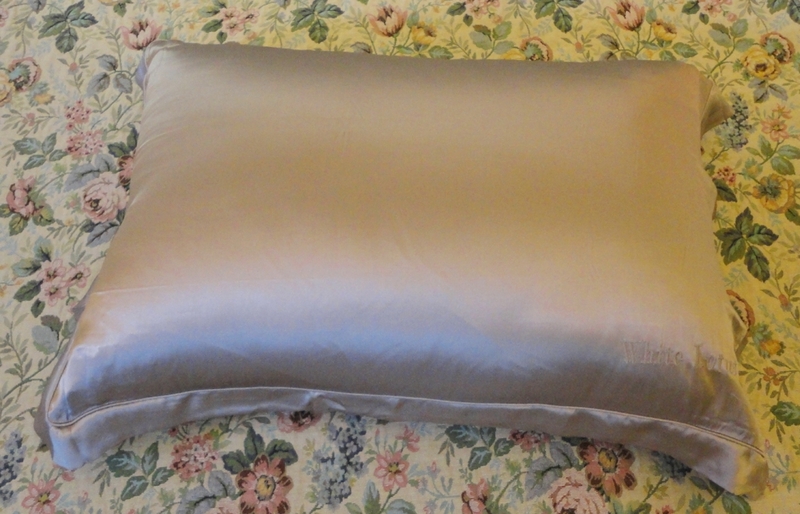 This pillowcase is made of 19 momme silk, and I can confirm that it looks gorgeous. 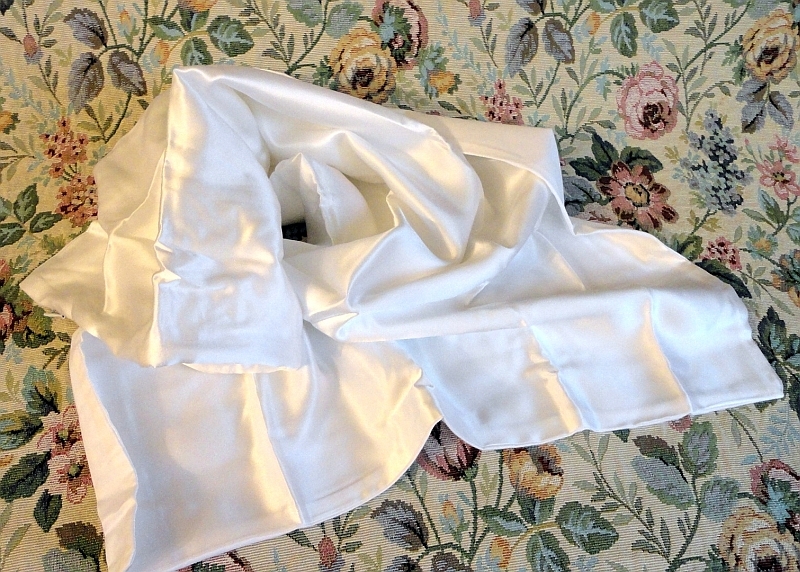 It washes beautifully (use delicate fabric care, of course, 30 degree water, low iron) and dries fairly quickly. I haven't used a clothes drier in years, so it goes on the line. My husband has a full head of hair (I won't say his age but I'm 62 and he's older than me), but lately he was bothered by what looked like a patch of thinning hair, basically where his head rests on the pillow as he sleeps. To his delight (and my relief) this anomaly has disappeared since he has started to sleep on silk. We can't really expect much on the wrinkle prevention front (maybe too late for that) but the difference in the look of his hair is amazing. So we are both sold on the benefits of using a silk pillowcase, but I think it's important to choose a good quality one. The other thing that makes this case special is that it is very large and I was able to place my most oversized, fluffiest pillows in it. So to say I am delighted with it would be an understatement. We are now both sleeping on silk and, when they need to be washed, I make sure to do it first thing in the morning, so they are ready to use the same evening. Don't let the price put you off, this is one of those investments in quality of life that you are not likely to regret. The presentation is quite simple, just see-through plastic wrapping, but the contents would make a wonderful gift for a loved one, or just for yourself. This pillowcase was sent to me for evaluation six weeks ago and I have given it a very thorough testing by using it on and off since it arrived. I sleep on it for a few days, wash it, let it dry naturally in the sun and start using it again a few days later. Alternating with my other pillowcases (which are of top quality cotton or linen) has allowed me to observe the differences. 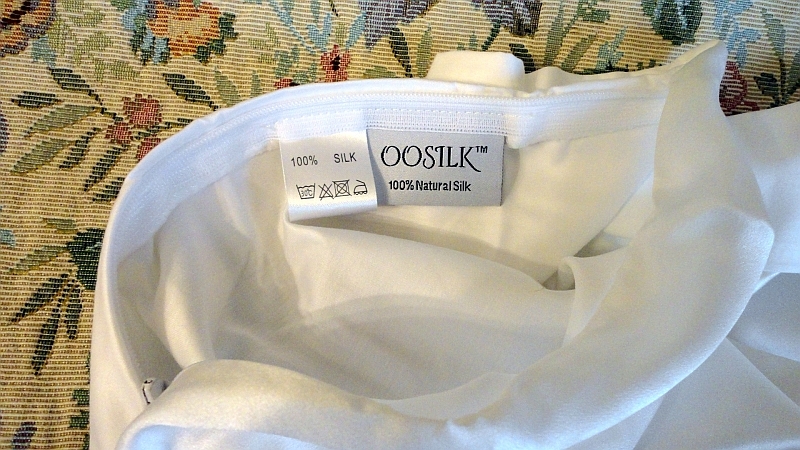 I have found that I love sleeping on silk! I can't say it has eliminated my wrinkles because at 62 nothing short of a miracle could do that, but it is certainly very pleasant to have close to my face, and I have noticed that my hair seems to be more manageable during the “silk rotation”. 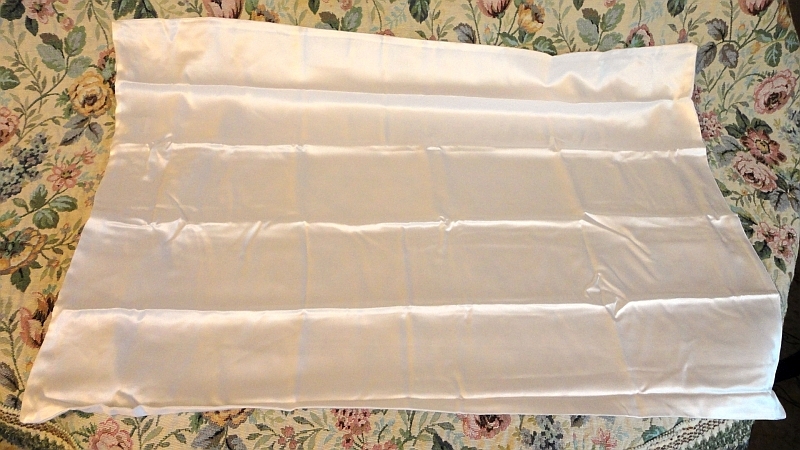 The fact that the underside is cotton is a plus in my case, because I use two pillows and a silk backing would slip and slide all night long. Also I appreciate how it helps to keep the price down, so one can have two pillowcases for the price of one of the all-silk ones. My colour choice was Ivory to match the rest of my bedlinen, but I can see that the other, darker, colours are absolutely beautiful. 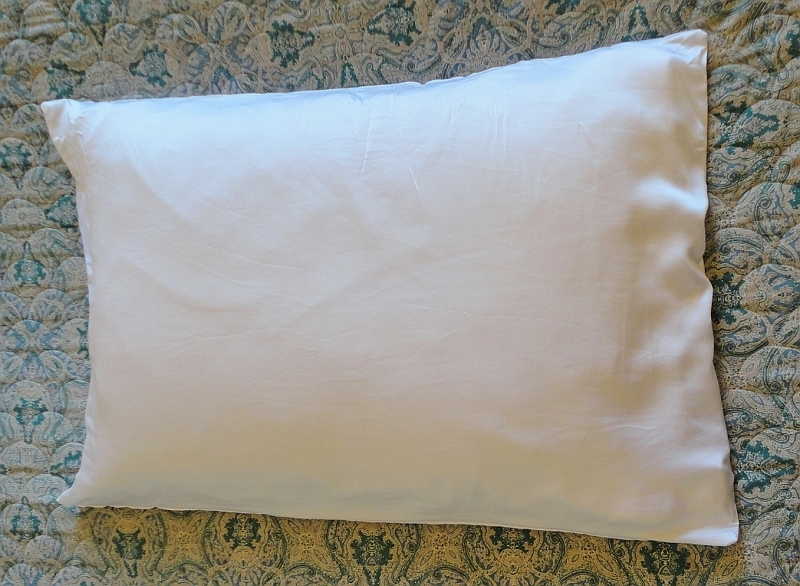 This pillowcase is large enough for all my pillows and the zip runs well and disappears discreetly down the side. If you are thinking of giving this as a gift, the black box with the raised logo is, I think, standard and makes a lovely first impression. Very suitable as a present for a loved one, or just for yourself. When I was offered this cushion to review, it sounded like it was made for me. I have frequent hip pain (especially after sitting for a long time), suffer from sciatica and, many years ago, I fractured my tail bone. I liked the look of it immediately: a plush, fluffy cover with a side handle for carrying. The colour is elegant and understated, a beautiful silver grey that should harmonize with most décors. I find the fabric very comfortable after hours of sitting at the computer. The cushion is a bit harder than I expected and, because the foam is so dense, it is not likely to squish down and lose volume as thinner, more open foam usually does. It seems to adapt to my contours and I think it will become even more comfortable as it moulds to my body. The best feature is that it is shaped and angled to provide lumbar support and allow the spine to settle into a naturally straight position. This is the reason that, at first, I did not find it all that comfortable. It was fighting my slouch! I just bought a great office chair, and the combination was almost too correct. The claim that it relieves pressure on the buttocks and upper thigh is true to a point. When I first sat on my new cushion, I felt more pressure on my seat bones and less on the front of the thighs. So there is a readjustment phase to go through, after which the cushion becomes addictive. The keyhole cut-out at the rear effectively removes pressure from the base of the spine, and helps with these temporary aches I get when the weather changes. 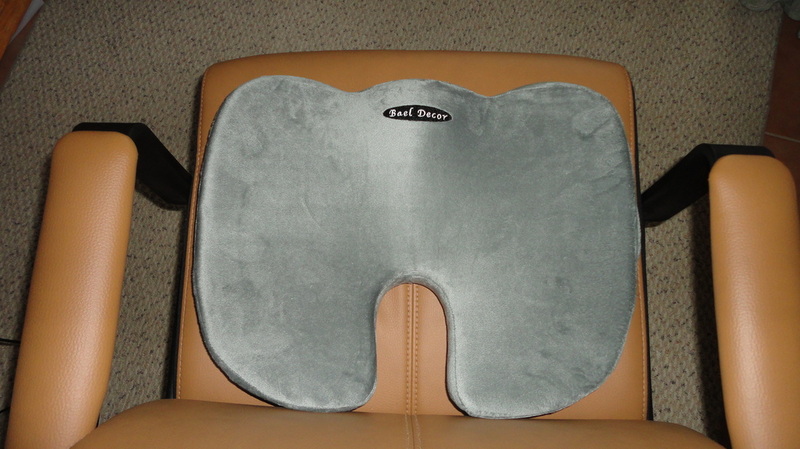 I have tested this cushion at home in different chairs, but also in the car, where sometimes sitting for long periods makes my hips very stiff. Again, this cushion provided relief and, at journey's end, I was a lot more comfortable than usual. One thing to keep in mind is that it will add height to your sitting position, so a computer chair or car seat may have to be adjusted accordingly. A very welcome way to take the discomfort out of long hours at my desk.